The HEC decision to call 14 days of strike action in pre-92 universities to defend our USS pensions from the theft employers are planning is transforming the union’s branches. In FE, ballots are on-going over pay, which could lead to joint strikes across the two sectors. At the heart of both strike calls is an out-of-touch neo-liberal management and government policy which is wrecking tertiary education to privatise it. As we know from the NHS, you can’t privatise a sector with popular support unless you wreck it first. In HE, union meetings are large and determined to make the action effective. UCU membership is growing rapidly, especially among vulnerable groups such as hourly-paid and casualised staff. Liverpool held a meeting of 96, Goldsmiths around 100, Lancaster, Imperial, Manchester, Heriot-Watt, Glasgow and Dundee saw meetings of similar sizes. In one day last week UCL had five department meetings, each attracting up to 25 members. Branches are reporting dozens of new members. Bristol has seen their membership grow by over 25%. Among students too we are seeing widespread support for our strikes in HE. At Kings and York, students are demanding their fees are returned while expressing support for their lecturers. Our historic ballot result and now strike call in HE is creating an earthquake in our universities. In FE, ballots over pay are also galvanising support. A Tower Hamlets College mass meeting received a donation of £1,000 from Queen Mary. Reports from branches indicate that they too are heading to smash the Tories anti-union law threshold of 50% turnout. The reasons for these developments are simple. Members understand the scale of the onslaught. Our USS pension scheme has an £8bn surplus and £60bn of assets, and is growing with a positive cash-flow. Yet the changes will destroy all this by creating a rising deficit and a negative cash-flow. Financial vultures are now circling the scheme for the massive profits they can make out of members’ fears and desperation as they look to transfer their pensions out of USS. The move to individualised pensions will rob casualised staff from any chance of getting a decent pension if and when they finally become permanent. In FE, pay has fallen consistently from employers’ failure to offer pay rises that even meet inflation while in many colleges management don’t even agree to pay the negotiated pay rise. The abandonment of national bargaining has been a disaster for members in FE. Beyond UCU, the action is also getting support with NUS and other student associations pledging support for the strikes. John McDonnell, Labour’s Shadow Chancellor, has pledged support, as have local Trades Councils pledging to establish hardship funds. This is a crisis flowing from the marketization of tertiary education. Universities and colleges are seeking to disentangle themselves from a collective higher and further education system in a race for student fees. Students are facing ever-growing debt to gain a qualification supposed to provide a future of secure and well-paid employment. Staff are promised a decent future pension if they forgo decent pay today. All of this is being torn apart by government policy and the creation of a market for education encapsulated in the passing of the Higher Education and Research Act in 2016. The Act opens up universities to privatisation and lets private companies award their own degrees. It encourages FE colleges to focus on high-priced degree-level students at the expense of the social inclusion education they have excelled at. The USS pension’s dispute is now at the sharp end of this crisis because members are showing they are serious about striking. Again, government policy is at the heart of this dispute. Quantitative Easing since the 2007 financial crash has made government gilt-based valuations completely at odds with the real value of the schemes they are supposed to protect. In USS’s case, a scheme with an £8.3bn surplus is somehow in deficit to the tune of £7.5bn. This deficit is a fiction designed to hide the theft of our pensions. It is nonsense, and members throughout out union are saying so. 1. 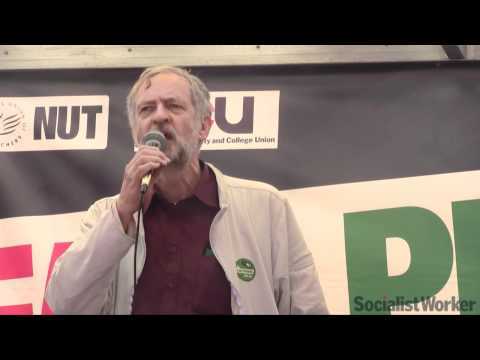 We need to mobilise members to take control over their strikes. Organise teach-outs, make our picket lines centres for solidarity demonstrations and a focus for organising. For example, events such as International Women’s Day on the 8th March provides us with an excellent opportunity to put a focus on pension inequality. The same can be done for BME staff on UCU’s day of action over racism on 28th February. We should organise another themed day for casualised staff. All of our activity must have the aim of building participatory strikes, drawing in the many new layers of members who are looking to UCU for leadership. 2. We need to turn to a political campaign to lobby parliamentary bodies in Westminster and the devolved nations to back our strikes and act to end the destruction of our sector. London Region UCU has called a demonstration to the Westminster Parliament on 28th February. We can make this demonstration the biggest UCU demonstration in years, and demand the government guarantee our USS pensions and pay up for FE. 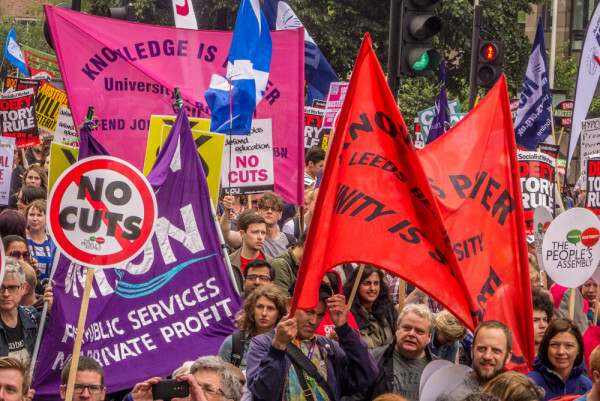 This is a once-in-a-lifetime opportunity to reclaim the universities and further education colleges, in order to return them into public bodies in which education is for all. We can stop their transformation into profit centres for big business. And in the process we can fight for real education – from Cradle to Grave. UCU members have a vote in the NEC elections taking place this month. We must take the opportunity to elect the UCU Left candidate Nita Sanghera as the union’s first black woman Vice President. We should also back other UCU Left-supporting candidates who can ensure the lessons of this battle become embedded within UCU at the top of our union.